The Princess Shop will resume regular business hours on Thursday, 8 January 2015. Best wishes for a very happy holiday from Karen and the volunteer team! Looking for information about our programs and events? See below for more information about how to donate a dress, apply for our 2015 Dress Program, and more information about our upcoming Glass Slipper Benefit. We love to accept dress donations! It keeps our inventory fresh and interesting for each year's Princess Graduates. Please consider donating a dress that you think a 2015 graduate would wear (less than 5 years old, preferably). If you provide your contact information, we will send you a photo of a Princess Graduate in your dress when it is selected for a graduation ceremony. Please click here for more information. During office closures, please drop off donated dresses at our Primrose Pizza Hut drop off location. The Princess Shop’s Dress Program lends donated dresses and accessories to female graduates in need, to enhance their graduation experience. The organization hopes to find the perfect dress for every young woman who requires services. Princess Graduates have the opportunity to be lent a graduation dress, accessories, shoes, etc. donated by members of our community. Please click here to learn more about our dress program and how to apply for the 2015 graduation season. The Glass Slipper Benefit is The Princess Shop's annual fundraising event that celebrates the current year's Princess Graduates. It is an opportunity for the community to gain a glimpse into the impact The Princess Shop makes in Saskatoon and throughout Saskatchewan. This year’s Annual Glass Slipper Benefit for Princesses will be held on Wednesday, April 15, 2015 at 5:30pm at TCU Place in Saskatoon. Tickets are now available! For more information about The Glass Slipper Benefit and how to purchase tickets, please click here. The following is a post from Erika, one of our Fairy Godmother Program Coordinators. Erika and Olivia organize monthly activities for our Fairy Godmother Program participants to take part in as a large group. Fairy Godmothers and Princess Graduates also meet on their own time during the month, one on one, to develop their relationships as matches. 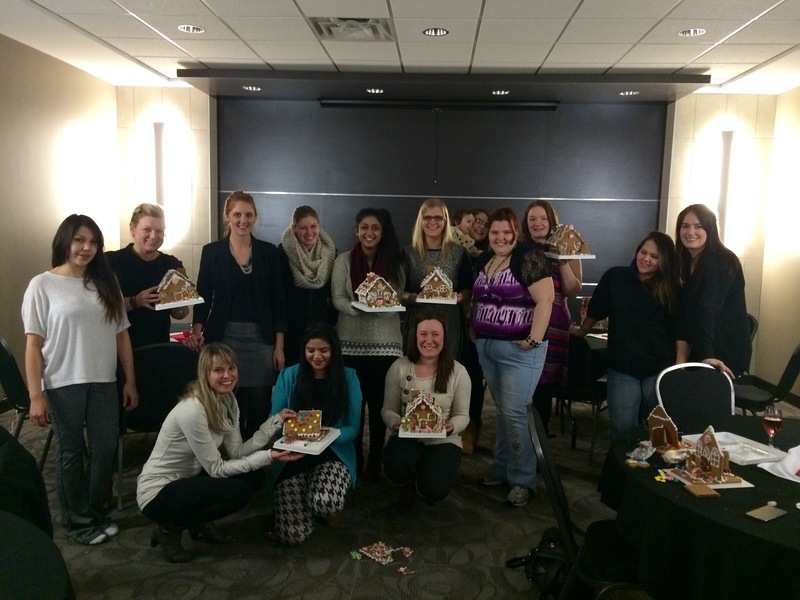 On December 3rd, participants of the Fairy Godmother Program gathered at the Ramada Hotel to indulge in an evening of appetizers, socializing and ginger bread house building. The majority of our program participants were able to attend and some were even able to bring their sons and daughters along for the evening. The Ramada was beautifully decorated to reflect a winter wonderland while music played softly in the background. The atmosphere was warm and welcoming. Appetizers and punch were shared as the group discussed plans for the holidays. Each match made a ginger bread house together to take home and share with their families. The group was creative, to say the least! Lots of laughs were shared at the final outcomes of the ginger bread houses. The Christmas party served as an excellent event for the matches to connect before the chaos of the holidays and final exams take over. The program has been rewarding thus far for all parties involved, and we cannot wait to continue into the new year!